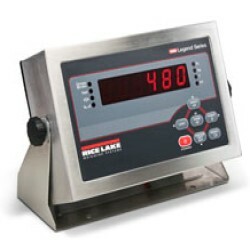 The Rice Lake Weighing Rough-N-Ready line of heavy duty floor scales is a premium high end line of industrial floor scales with the best warranty. The Rice Lake Rough-n-Ready System 4' x 4' 5000 lb. Floor Scale / Indicator Package features quick connects and factory calibration which allow the package to operate immediately with minimal setup. This timesaving solution combines a NTEP 5000 division RoughDeck floor scale with the 480 Legend digital indicator calibrated and ready weigh. Ships from Rice Lake, Wisconsin. The 480 Legend replaces the older IQ 355, and is a stainless steel enclosed high quality AC powered digital readout with 7 button front panel. The weight is displayed on the weight readout in bright red LED digits. Ideal for shipping/receiving and manufacturing applications, this impressive pallet weigher system comes complete with an indicator tilt stand, 20' of SURVIVOR EL147HE 6-conductor hostile environment load cell cable and a quick connection. The fact is that we have 48" x 48" Roughdeck scales that have lasted for years! We are confident that you will love the performance and value the scale offers. Digital Indicator has 2 year factory warranty. Scale Includes a 5 Year Factory Warranty! Legal for Trade, NTEP Approved System. FEATURES THE 480 LEGEND DIGITAL WEIGHT INDICATOR! Roughdeck Floor Scales are an OUTSTANDING VALUE -- Scale ships standard motor freight ground to business addresses only (Zoned Commercial) with a loading dock or fork-lift. All other charges are the buyers responsibility. (Liftgate, Residential, Construction, Military). Indicator ships UPS Ground.